In October 2014, Bing Ads launched Universal Event Tracking (UET)--a tool to track user engagement, goals, and conversions after a Bing ad is clicked. 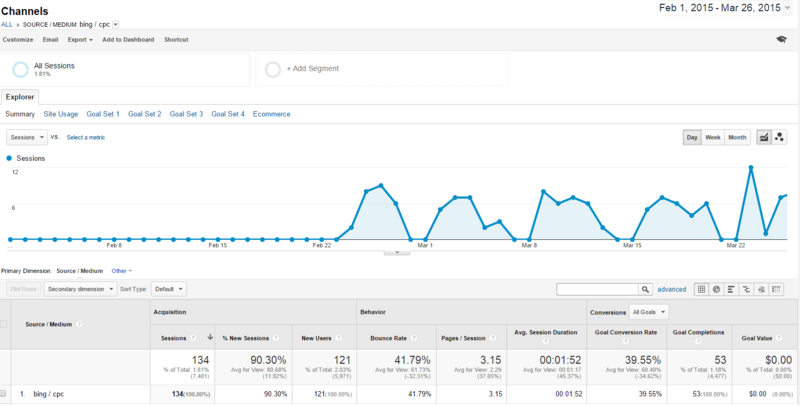 UET enables tracking of website engagement metrics from Bing paid search in Google Analytics. UET is Bing's replacement for existing goal and conversion tracking in the Campaign Analytics tab in Bing Ads. UET provides advertisers better analytics data on goal and conversion tracking metrics because it tracks conversions at the customer level across all accounts and goals. Before UET, advertisers could only track Bing paid clicks accurately by adding custom UTM (urchin tracking module) codes to the destination URLs. Implementing UET eliminates the need for UTM codes. Bing Ads UET automatically adds four types of UTM tags to the destination URLs of your ads and keywords: utm_source, utm_medium, utm_term, utm_campaign. Identify the most effective ad campaigns based on conversion goals. Identify keywords which lead to conversions. Learn which customer segments get more conversions. Track conversions across multiple devices. Obtain data on bounce rates, pages per visit, and duration per visit at the keyword level. UET lays the groundwork for audience based remarketing in Bing paid search by providing audience segmentation abilities. This tool will be available in Bing later in 2015. UET works by placing a small snippet of code on the website called a tracking tag. The tracking tag is not goal specific so one tag can support multiple goals if you place the tag site wide. There is no need for multiple tags to track multiple goals, although custom code is required for Event Goals (see below). Destination – goals achieved when a destination URL is loaded. Duration – goals defined by how long a user session lasts on a website or page. Pages/Visit – goals defined by how many pages a user visits per session. Event – goals defined when a specific action is triggered on a site (e.g., click on a specific button or tab on a page) (requires custom tracking code to be written and installed on the website in addition to the UET code). New - for accounts with no previous conversion tracking. Existing - for accounts with conversion tracking set up under Campaign Analytics. Install tracking tag on website - The UET tracking code can be added anywhere on a webpage and should be on every page. 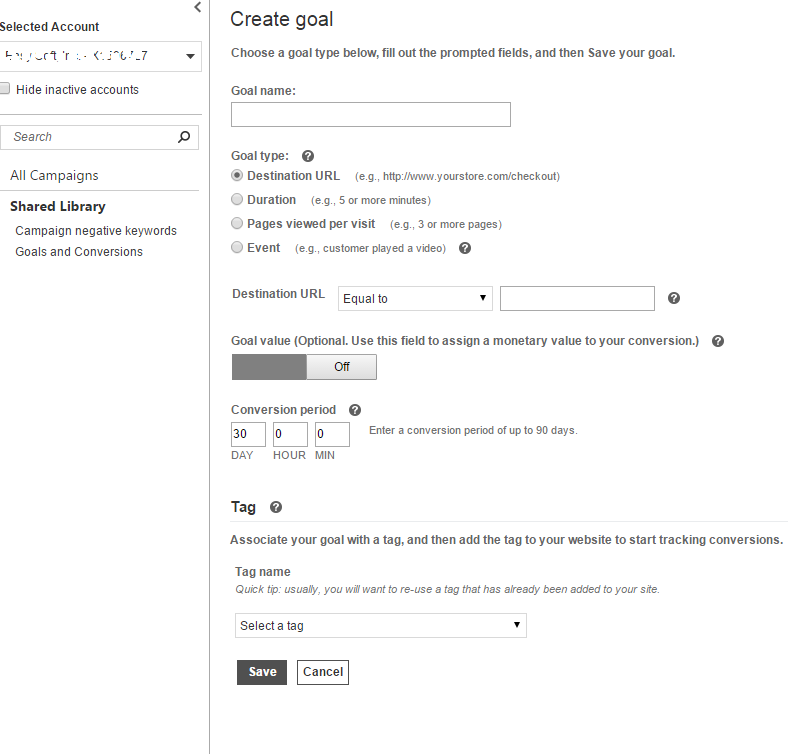 Generate additional goals and assign them to the UET tracking tag that was already generated. Create new goal in Shared Library/Goals and Conversions. Install new UET tracking tag on website. The UET tracking code can be added anywhere on a webpage and should be on every page. Remove old Campaign Analytics tracking tags from website to avoid double counting conversions. Disable analytics under Campaign Analytics. Additional instructions are available at Bing Ads Help for UET. The screenshot below displays user engagement metrics in Google Analytics being tracked from Bing/cpc. A successful search advertising campaign requires insights obtained from analyzing web traffic data. This data allows an advertiser to optimize campaigns and send the right message to the right target audience. Using Bing UET will provide additional data to advertisers to maximize the effectiveness of Bing Ads campaigns and compare performance to other paid sources. Thank you for the simplifed article on UET! I was wondering how people tracked conversions via Bing. Would you recommend leaving Adwords auto-tagging on and using Bing’s UET in order to get the clearest synced read? And which tag manager would you recommend? The best way to get a complete picture of how your PPC ad campaigns are performing, is to install Google Analytics, Google Adwords Conversion Tracking, Bing UET and to turn on auto-tagging in both platforms. Google Tag Manager is a great and free way to manage all of your tracking codes in one place outside of the website code. Thanks for checking out our blog! Glad we could be of assistance. How would I track a bing shopping campaign as opposed to other cpc campaigns in google analytics? and how about a tuturial explaining how to track bing trafic in analytics?